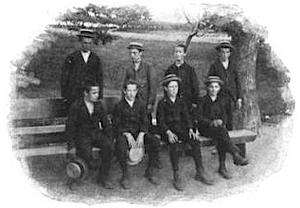 A steady stream of ten boys, each jumping from the classroom windows of the Rainsford Island House of Reformation, sprinted for the shore under the cover of the night fog on August 19, 1899. They found their way through the brush by the light of the fire that raged through their prison behind them. As the boys reached the shore, a boat appeared and several of them crawled into it. The rest found another boat nearby, belonging to a lobsterman, and stole away in that. From there, the boys escaped first to Moon Island, and then into Boston itself. While the boys slunk off into the darkness, the prison’s superintendent, John C. Anthony, was the first to notice the flames issuing from the north wing of his House of Reformation. Just days earlier, the same building had been set afire. And the day before, a boy named Joseph Sullivan escaped by jumping off the island’s gangplank and swimming over to Hull, across Boston Harbor. Sullivan had told his fellow inmates that, if his escape was successful, he would return to help the others. Superintendent Anthony issued the alarm. Within moments, his sixteen officers directed the House’s remaining inmates as they took the fire hose and began their efforts to fight the raging fire. It proved little use. The poor quality hose kept splitting. Whatever little water pressure they had was leaking away before the water even had a chance to hit the flames. As the fire raged, Superintendent Anthony called Superintendent Hopkins of Boston Harbor’s Long Island for help. Their ship, the John Howard, soon arrived. The men from the Howard found the north wing completely ablaze, and the inmates fighting the blaze with their single line of hose that had burst in many spots. The crew of the Howard aimed two streams of water at the fire while Superintendent Anthony put in a call to Boston, which also sent a ship of firefighters to the island. Their ship arrived, and their crew fought the flames alongside the crew of the Howard, and the inmates. The fire was gradually brought under control, but not before the North Wing’s top two floors were destroyed. In the commotion caused by the fire, twenty-five Boston City policemen arrived to guard the island’s shores trying to prevent the boys still missing from escaping the island. They found boys running about the island “as they pleased, like Fijis”. Some tried constructing rafts and floating away into the harbor. One boy, named McNulty, nearly drowned about 50 yards off the shore of Hull, before he was rescued from his floating log by a reporter named Frank Sibley. Two other boys were later found crawling through a cornfield in search of driftwood that they too hoped to use for a Hull-bound raft. As midnight approached on that Saturday night, Boston police had rounded up nearly all of the boys who hadn’t managed to escape the island’s shores. The boys were gathered on the House of Reformation’s recess yard and spent the night in the chapel, which had not been destroyed in the fire. Sleeping atop mattresses that had been pulled out of the burning building, some of the island’s more unruly boys caused trouble for the guards, yelling, hollering, and calling them names. The guards tolerated the abuse, owing to the boys’ agitated state of mind, but after some time, they adopted ‘extreme measures’ to restore the peace. A few ‘knock-down’ battles ensued between police, prison officials, and prisoners. Eventually, the law got the upper hand. With the unruliness reigned in, the officials picked out eight of the worst offenders and subjected them to “the administration of the rattan stick” the next morning, when they were made to bend over a bar and were flogged. As for the boys who escaped, they remained at large for weeks before law enforcement was able to recapture them. In the investigations occurring in the weeks and months following the fire, cases of prisoner abuse were unearthed, and Superintendent Anthony resigned his position. Four of the ten escapees were later charged with setting the fire. Their names were not immediately released by authorities, but were known to the local press soon after the arson. James McNulty, the boy later rescued while adrift on a log several hundred yards from Hull was among their number. The investigation found that the boys used shavings, paper, and oil that they had hoarded during the months before the fire. Escaping to the attic on that Saturday night, the four boys lit several spots in the attic at once, and watched as the fire rapidly gained ground. McNulty, after his recapture, was later implicated in the August 1900 burning of a barn at another reformatory school, in Westboro, Massachusetts. Rainsford Island, an 11 acre island in Boston Harbor, is named for Edward Rainsford, one of the island’s earliest settlers. In its history, Rainsford Island has been known by a number of names including Hospital Island, Pest House Island, and Quarantine Island. Since 1996, Rainsford Island has been a part of the Boston Harbor Islands National Recreational Area. A municipal institution, the House of Reformation at Rainsford Island housed boys between the ages of 18 and 20 years old who had been sent there for all sorts of crimes, ranging from serious crimes like assault with intent to kill and larceny to the crimes that were substantially less serious like stubborn child and ‘playing ball on the Lord’s day’. The House of Reformation, later named the Suffolk School for Boys, operated on the island from 1895 to 1920. The school housed a three-and-a-half story building with two wings, known as the North and South Wings. At the time of the fire, 140 boys had been incarcerated there. Most were housed in the House’s North Wing, which held 115 boys. I grew up in a nearby town, Squantum, Mass. When I was a teenager in the 1940’s, we knew some of the boys who somehow would come across to our area and visit with us. There was nothing physical involved, just boys and girls talking. If I remember correctly, and that is a challenge, there were only 3 or 4 boys in the group our group of about 4 girls met with. We really knew little about the island. Hi Ginny – that’s really interesting! Thanks for sharing this story. I wouldn’t have thought that it would have been that easy for the boys of the island to stage ‘temporary’ escapes. My grandfather may have been a part of this group. I read his name in association with an escape attempt across the frozen harbor. How can I find out more about this? Hello Martha, thanks for your comment. I don’t have much more information beyond what’s already in the post, but you may want to contact the Friends of the Boston Harbor Islands at http://www.fbhi.org. Good luck!